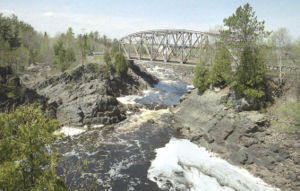 The Saint Louis River is a river in Minnesota that flows into Lake Superior. The largest river to flow into the lake, it is 179 miles in length and starts near Hoyt Lakes, Minnesota. The river's watershed is 3634 square miles in area. Near the Twin Ports of Duluth, Minnesota and Superior, Wisconsin, the river becomes a freshwater estuary.